Packing all the high-rolling fun of Las Vegas into three days doesn’t have to be a gamble—Sin City offers nonstop excitement morning, noon, and night. Here are our favorite ways to enjoy the sights, adventures, and glamour of Vegas in three days, while still leaving time to visit the nearby Grand Canyon. 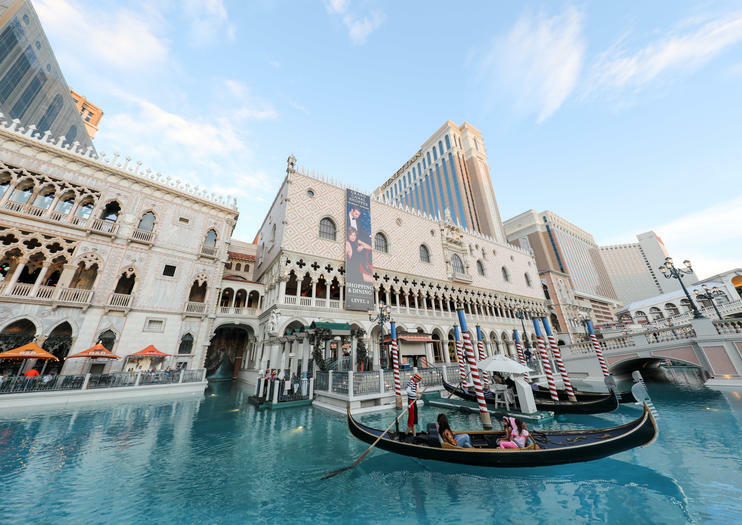 Get an overview of the city on a hop-on hop-off tour along the Strip, where you can visit attractions such as the observation deck at Stratosphere Tower and the Eiffel Tower at Paris Las Vegas. Both of these landmarks offer a look at Vegas from above—a great way to start your exploration. Or perhaps check out the Mob Museum, one of the most interesting things to do in Vegas, providing a little history in a city that’s always evolving. When evening rolls around, hop on the High Roller, the observation wheel at the LINQ Hotel and Casino. As you take a spin, you can enjoy happy-hour drinks from the onboard bar. Then stroll over to the Bellagio Fountains to watch the musical water show before heading inside the hotel for a performance of O, a favorite among Vegas’ many Cirque du Soleil shows. While there’s plenty happening on the ground in Las Vegas, a lot of the action takes place in the air. Depending on your tolerance for thrills, begin your day with a sunrise hot-air balloon ride or a plane ride above Red Rock Canyon for a tandem skydiving experience. Then keep the adventure going at the Stratosphere Tower with the Unlimited Ride Pass, which provides access to three extreme rides: X-Scream, Insanity, and the Big Shot. Or opt for some serious bragging rights by booking a fighter pilot experience that gives you the opportunity to fly across the desert with a real fighter pilot. When darkness falls, admire the lights of the city on a nighttime helicopter tour before touring the Strip like a VIP in your own limo with a personal photographer to document your exploits. East of Las Vegas you’ll find Grand Canyon National Park, one of the biggest and most significant natural attractions in the United States. It’s easily accessible on a Grand Canyon day trip from the city by helicopter, airplane, or coach bus. Some combo options include a helicopter ride to the canyon’s west rim, a boat ride on the Colorado River, and the chance to walk out on the glass-bottom Grand Canyon Skywalk, located outside the park in the Hualapai Reservation. When you return to the city, spend your last night exploring the clubs and lounges of Sin City with an all-access nightclub pass. Take flight in a fixed-winged plane from Boulder Terminal and make your way to the South Rim in Grand Canyon National Park. Check out epic vistas, stunning landscapes and popular attractions like Bright Angel and Mather Point. This tour also includes an incredible 25 to 30-minute helicopter flight over the Canyon. Explore the bright lights of the famous Las Vegas Strip in a stretch limousine and have the evening documented by a professional photographer during this tour. Select a 1- or 2-hour experience, then stop at any of the popular Sin City casinos and/or attractions desired. Along the way, a photographer will capture the festivities with pictures that will be sent via email the following day. It’s a great idea for celebrating a special occasion — or just a night out on the town. Hotel pickup/drop-off and bottle of champagne included. Play the role of fighter pilot on this adrenaline-rushing, 15-minute thrill ride over Las Vegas and the surrounding region. Climb into an Extra 330LC aircraft with a professional fighter pilot and soar low over the mountains and valleys of the Mojave Desert, with great views of the surrounding landscape, including the Las Vegas strip. Fly at speeds up to 250 miles per hour, then experience some aerobatic maneuvers followed by a military-style landing to end this exciting aerial adventure. Las Vegas hotel pickup/drop-off included. Total tour time is three hours.